Place mustard seed, fennel, coriander, cumin, and peppercorns in a dry skillet. Place over medium heat, moving skillet to keep seeds from burning, until aromatic, about 2 minutes. Mustard seeds will begin to pop. Transfer seeds to a spice grinder, cool slightly, and pulse until finely chopped but not powdery. Transfer mixture to a small bowl, and stir in the thyme, dry mustard, ginger, 1 teaspoon salt, and sugar. Set aside. Heat oven to 450 degrees. Position two racks in oven. Spray a small roasting pan and a large cookie sheet with cooking spray; set aside. Cut potatoes into 1/3-inch-thick sticks. In a bowl, toss with oil and 3 tablespoons spice mixture. Spread in a single layer on cookie sheet; bake on bottom rack 15 minutes. Meanwhile, rub pork with 1 tablespoon Dijon mustard. Sprinkle with 1/2 teaspoon salt and 2 tablespoons spice mixture; pat with hands to make it stick. Lower oven to 425 degrees; place pork in prepared pan. Place on upper rack in oven. Cook until fries are golden and pork is cooked through (145 degrees internally), about 25 minutes. Transfer fries to a bowl and pork to a cutting board; cover both loosely with foil to keep warm. Place roasting pan on stove over medium-high heat; stir in wine, scraping bottom of pan to release browned bits. Stir in stock; cook, stirring occasionally, until reduced by half, 5 to 7 minutes. Whisk together flour with 1/4 cup water in a bowl; whisk into simmering stock mixture. Whisk in remaining tablespoon Dijon mustard; cook until mixture begins to thicken, 2 to 3 minutes more. Stir in berries; cook until they begin to soften, about 2 minutes. Season fries with remaining 1/2 teaspoon salt. Slice pork, and transfer to platter. 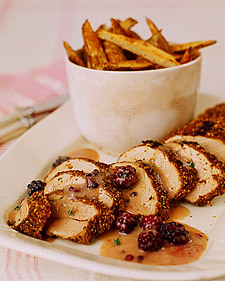 Serve immediately with blackberry-mustard sauce and chopped thyme.